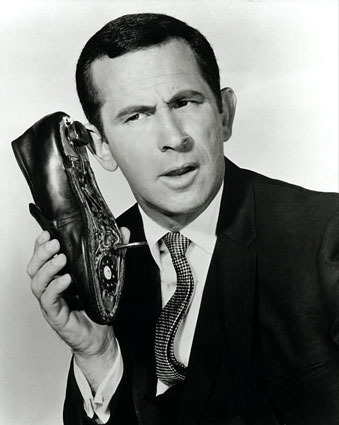 Patriot Act – Did You Check First? 9 Internet companies whose servers the NSA allegedly tapped, according to documents leaked to The Washington Post and The Guardian. The tech giants affected are reportedly Microsoft, Yahoo, Google, Facebook, PalTalk, YouTube, Skype, AOL, and Apple. Started with W. Still going on. Still think it’s wrong. Where Was GOP Outrage Before Benghazi? I find the GOP’s outrage over Benghazi to not only be an insult to everyone who died in the illegal and unjust wars waged by Cheney and Bush, it’s an insult to every thoughtful American who knows full well what they’re doing now. They stayed silent in the Bush years because it wasn’t in their political interest to express any real and sincere outrage at a time when it was actually justified. Now they want us to think they’ve suddenly developed a conscience? For most politicians, outrage is put on display only when it suits them and their purposes. The GOP have become absolute masters at this since the 2008 election. This feigned outrage over Benghazi is just the latest example. It’s a weak and pathetic attempt to dupe Americans into believing that the White House and the State Department actually colluded and intentionally misled us so that Obama could win reelection. News flash: He didn’t need the help. It was a landslide on every level and in every demographic except older whites. What’s particularly stunning is the GOP’s audacity to complain about wanting a smaller government while they’re wasting time and effort on Benghazi, as well as finding the time to vote for the 37th time to repeal a law SCOTUS says is legal. Give it a rest, already, Republicans. You’re actually past embarrassing yourselves, and it’s really starting to look like some kind of clinical psychosis. Democrats are no prize, either. They’re barely different, really, but they are just different enough. At least the Blue Team doesn’t deny science and actually cares about programs that support human and civil rights. What I am upset with the Democrats about is their capitulation, cowardice, and silence during the W years, and with Obama’s Republican-lite approach on too many things. AP tapped? Why are we surprised? Want to know why the government felt it was ok to tap the Associated Press? Trace it back to the fear we bought into after 911 and the rush in DC by the Legislative and Executive branches to empower our government to take away some (a lot) or our freedoms and liberties with the Patriot Act and the FISA amendments that allow the continuation of warrantless wiretapping. Holder says it was to protect us. That excuse was perfectly fine with Republicans when Bush used it. For what it’s worth, I’m proud to say that I marched with thousands of people in DC twice in protest of Bush, the Iraq war, and this overreach of government power. I haven’t changed my mind about any of it. I’m disappointed in Obama for not doing more to reverse these trends. In fact, his drone policy is very disturbing. Still, I’d have him everyday over any GOP candidate. 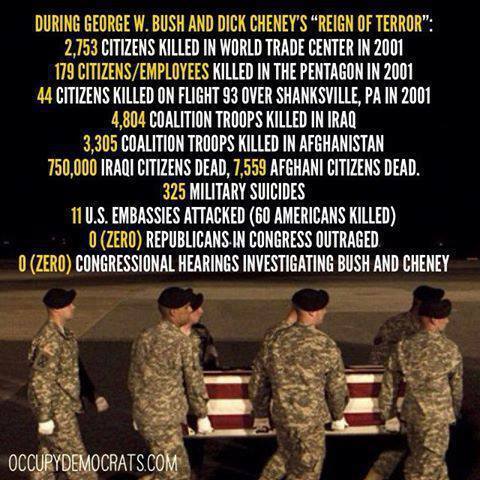 Maybe the GOP “outrage” over Benghazi can somehow be justified on some level. Time will tell, I suppose. The real question that’s going unanswered is where was – and where is – their outrage over what happened from 2001 to 2009 when a Republican was in the White House and all these people died for oil, money, and lies? Where’s their outrage over the mess W left with our standing in the world? Where’s their outrage over how our economy was crashed thanks to 30 years of Reagan’s failed trickle down economics? Where’s the outrage from having left yet another mess for the Democrats to have to clean up? Guess that explains the silence over Iraq. Republicans can remain confident in the knowledge that they can pretty much say anything is Obama’s fault and know that some portion of the population will believe it. Author Peaceful PatriotPosted on May 16, 2013 Categories Democrats, GOP, RepublicansTags Associated Press, Benghazi, FISA, GOP, Iraq War, Obamacare, Patriot Act1 Comment on Where Was GOP Outrage Before Benghazi?